Send your message to the Forests Minister! It’s hard to miss the huge new clear-cut on a steep slope just to the north of Fernie. Why are we allowing this kind of logging, right beside a town with as much tourism as Fernie, in 2019? It turns out that the clear-cut north of Fernie is on private land, owned by logging company Canwel—and logging on private land has to follow very few rules compared to logging on crown land. Even though we give land owners tax breaks for registering their land as Private Managed Forest, we don’t get much in return. Private land loggers don’t have to worry about wildlife, they don’t have to worry about local viewscapes or trails and they only have to leave a few trees alongside streams. Otherwise, they’re free to clear-cut for maximum profit, without worrying about long-term sustainability or their impact on the overall landscape. 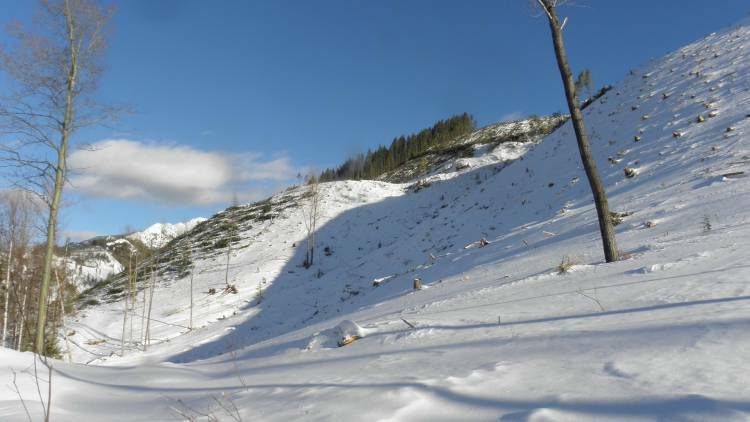 Now, a little private land logging here and there on small properties isn’t the end of the world, but a full third of the Elk Valley landscape is in private hands. A long time ago, the government gave a whole lot of land away to the railroads. That land ended up owned by Tembec, who managed it similarly to their logging on Crown land until 2014, when they sold a large block of lands to Jemi Fibre, which later was bought by Canwel. Now, Canwel owns an 1/8th of the Elk Valley. Since then, liquidation logging has been happening on private land all over the Valley. It’s not just the local impacts of the clear-cuts, but the cumulative impact on the landscape, where deer and elk are low on forest cover and connectivity for wildlife to travel is fragmented by a patchwork of clear-cuts. We’re making things worse and worse for wildlife and forests in the Elk Valley—and right now, there’s no way to stop the situation from getting even worse, because Private Managed Forests land-owners can keep cutting until they’ve cut almost every last tree. There’s no requirement for the yearly cut to be sustainable in Private Managed Forest, like there is on Crown land. And Canfor, who own the Elko mill, has been buying the wood from Canwel’s clear-cuts despite commitments through the Forest Stewardship Council to only purchase wood that is sustainably harvested. In most of the rest of the Province, private land logging isn’t as big of a problem as it is in the Elk Valley. BC is 95% public land and most of the logging in the Province takes place on crown land. But here in the Elk Valley, with so much of our forests in private hands and much of it held by one company who seem determined to get as much wood out of the Elk Valley as fast as they can, the lack of regulations for private land logging are putting our wildlife and our environment at risk. On Thursday, February 7th, Wildsight will host a public forum to give people a chance to learn more about private land logging in the Elk Valley—and to have a chance to speak up about the logging in their community’s backyard. A load of logs from a nearby private managed forest pass through Fernie. There’s no doubt that the latest clear-cut near Fernie would never have been allowed on Crown land. Aside from the environmental issues, this kind of logging threatens the tourist economy and quality of life in Fernie. No one wants to come visit a mountain town to look at huge clear-cuts and no one wants to ride their mountain bike through a clear-cut. The local community should have a chance to find out about harvest plans well in advance and to have their voices heard to make sure their values are protected. But on private land, there’s no requirement to consider nearby communities at all. It’s pretty clear that the the Private Managed Forest Lands Act has totally inadequate requirements to protect our communities—and our environment. The provincial government recently promised an audit of the provincial private managed forest system, but no further detail on the scope or timing of that process is available since the announcement in mid-January. If you’re in Fernie and you’re concerned about private land logging around town and in the Elk Valley, join us at the public forum at 7pm on Thursday, February 7th at Fernie’s Best Western Mountain Lodge. We’ve invited Canwell to come and share their logging plans for the Fernie area with locals, but we’ve not yet heard if they will attend. Logging has already started in new clear-cuts to the south of Fernie. The bottom line is that our Elk Valley communities need better regulations and more community input into what happens in our forests. It’s time for the Province to start applying the same rules on private managed forest land as they do on Crown land. Send a message to Forests Minister Doug Donaldson today asking him to update the Private Managed Forest Land Act.